Maternity sessions happen during all times of the year, and they can be just as beautiful in the cold winter months as the summer months! Luckily there are adorable maternity clothes that are picture perfect for all seasons. I have put together a few ideas for all you expecting mamas out there to consider when planning for your maternity session. I always recommend asking friends and family who have recently had children if they have maternity clothes you could peek through, you never know what treasures you might find. My sister-in-law sent me a box of maternity clothes and I lived in a few of her items through my pregnancy, it was wonderful! Links to these specific items can be found below all of the looks Coelle put together, and you can click HERE for more information on how to purchase the Sutton necklace featured in the first look. You can also shop your closet for similar items! 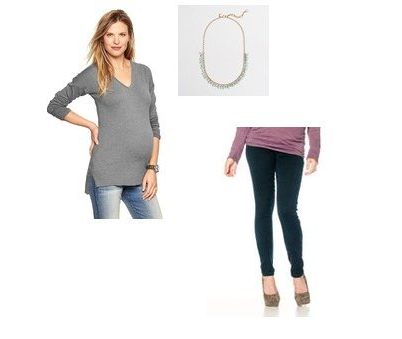 Items have been sourced from Motherhood Maternity (jeans, wine cords, and cardigan), Target (dress), Gap (sweater), Anthropologie (scarf), J Crew factory (second necklace). Maternity Dress sessions happen during all times of the year, and they can be just as beautiful in the cold winter months as the summer months! Luckily there are adorable maternity clothes that are picture perfect for all seasons.